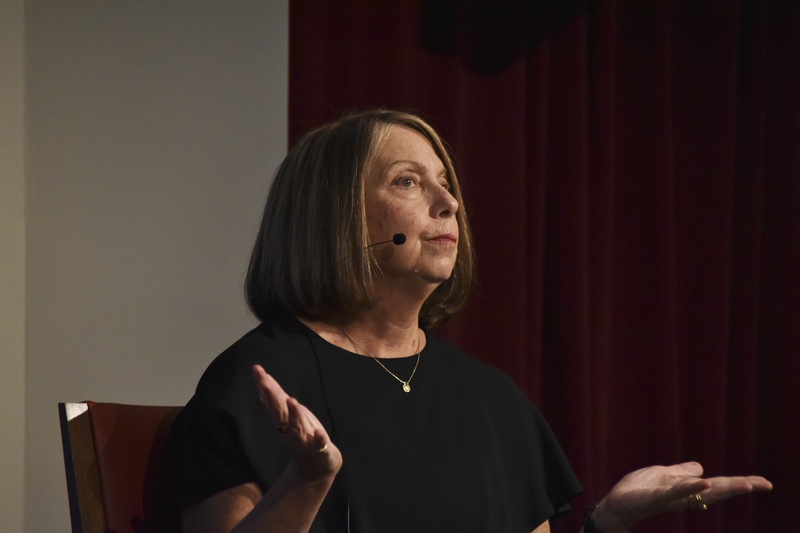 Jill E. Abramson spoke about the impact of the press on the political world at the Institute of Politics in Oct. 2018. In a series of tweets published Wednesday evening, Vice News correspondent Michael C. Moynihan accused Abramson of plagiarizing portions of her book, released Tuesday, which covers the volatile climate of journalism in the last decade. Moynihan wrote on Twitter that he became conscious of instances of alleged plagiarism while reviewing claims Abramson made about Vice within the book. News organizations from which Moynihan explicitly accused Abramson of plagiarizing include the New Yorker, Time Out Magazine, Columbia Journalism Review, and Ryerson Review of Journalism. He also cited a master’s thesis from Ryerson University and York University, which he alleges Abramson copied. On Twitter, Moynihan juxtaposed the passages in question from Abramson’s book with passages from previously published articles, revealing uncanny similarities — including specific details, phrases, and nearly identical sentences. Abramson did not include footnotes to these passages. “I did not have citations for seven short passages that contain factual information. These should have been either quoted in the text or footnoted,” she wrote. She noted that she had included more than 70 pages worth of footnotes covering hundreds of interviews. “I did properly credit these sources, some repeatedly, for other passages and material in the book. This makes clear that my errors were completely unintentional,” she wrote. “Anyone who knows or has worked with me knows that I would never intentionally use any other journalist’s work without giving them credit,” she added. One of the authors whom Abramson allegedly plagiarized, former Time Out Senior Editor Jake Malooley, directed The Crimson to his statement made via Twitter. “In a pretty brazen violation of journalism 101 ethics, Jill Abramson cribbed a passage from an article I wrote in 2010 and passed it off as her own,” the tweet reads. The article in question, published in Time Out Magazine, spotlighted a Vice correspondent and his experience reporting in the Middle East. Another writer whom Abramson allegedly plagiarized, Matthew Ingram, published an article Thursday in the Columbia Journalism Review affirming his belief that Abramson plagiarized his work. One of the passages under scrutiny from Abramson’s book is almost identical to an excerpt of Ingram’s 2018 article that cites the most popular news sources circulating on Facebook. Ingram wrote that he does not feel as though Abramson stole his ideas — the passage did not contain his ideas, but rather facts, he points out. Ingram, however, wrote that Abramson’s actions conform to what many would consider plagiarism, and he cited a past statement from Abramson in which she put forth a concurring definition. An hour after Moynihan publicly accused Abramson of plagiarism Wednesday evening, she unequivocally denied on live television during “The Story with Martha MacCallum” that she committed any citation errors in her book. “I certainly didn’t plagiarize in my book,” Abramson told the show’s host MacCallum. Abramson then suggested that Moynihan accused her of plagiarism because Vice was unhappy with Abramson’s portrayal of the news organization in her book. Moynihan did not respond to a request for comment. Only three hours later, Abramson tweeted that she was looking into the accusations. “She seems sincere ... that she cares about this and she wants to fix what went wrong. She described them as unintentional errors, and I have no reason to believe that that’s not the case,” Ingram said in an interview with The Crimson. Moynihan’s Wednesday Twitter thread is not the first time Abramson's book has come under fire for inaccuracies. The book first faced scrutiny last month when a copy was provided to journalists for review in advance of publication. Images of passages from the copy allegedly containing factual errors circulated on Twitter. Responding at the time, Abramson wrote in a Twitter post that the book was unfinished. Abramson spent 17 years at the Times, where she was the first woman to lead the news organization as executive editor starting in 2011. She was fired from that role in 2014 due to disagreements with the Times’ publisher, according to a New Yorker article published shortly afterwards. In 2014, she joined Harvard’s English Department as a senior lecturer. In her email to The Crimson, Abramson wrote that she encourages her students in her journalism classes to apply the “highest standards” to their work. —Staff writer Ema R. Schumer can be reached at ema.schumer@thecrimson.com.